Over the years, the story of Peter Pan has morphed from magical Christmas show into full-on riotous pantomime with varying degrees of success. 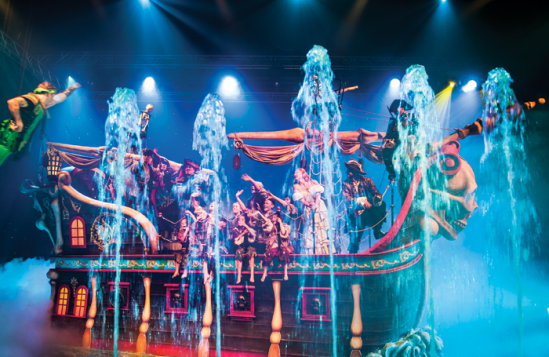 In his attempt to turn it into the biggest pantomime in the world, producer and director Jon Conway may have splashed out on an enormous Jolly Roger but in the process the show has been drained of any cohesion or charm. What remains of the story sits feebly between a jumble of special effects and speciality acts included as much to fill space as to enhance the narrative. It’s an awfully big arena and when in doubt, Conway crams in child dance teams, stunt cyclists, water fountains – anything to detract from the emptiness of this spectacle. Even Bradley Walsh, a dab hand as a panto comedian, is at sea here, his usual antics stretched too thin. Martin Kemp’s Hook lacks any real menace and his final engagement with Matt Knight’s Peter is an anti-climax, despite the presence of a lethargic giant crocodile. Hannah Grover, as Wendy, is an evident talent, although the insertion of a slosh scene sees her slowly gunged in an oddly uncomfortable, unnecessary manner. Along with Stephanie Siadatan’s scrappy Tinkerbell, they deliver the strongest character focus in an otherwise chaotic, misdirected spectacle. World’s Biggest Panto, Jon Conway Productions, The NEC Group Arenas, Wingit Productions, Q Productions, Tip Top Entertainments .